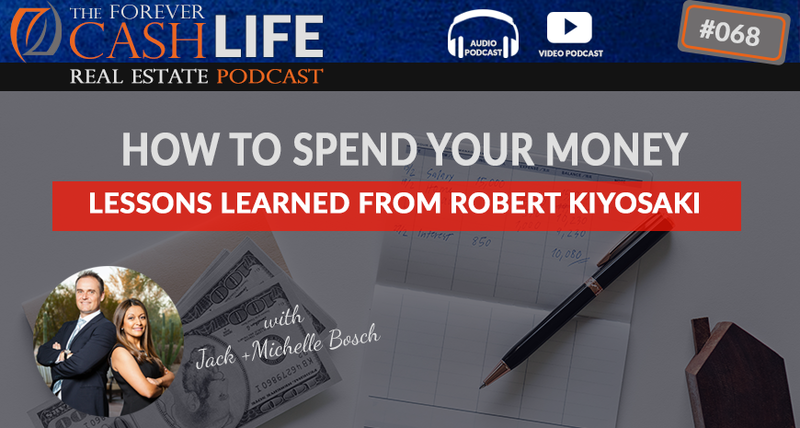 Jack Bosch talks about the lessons he learned from the legendary Robert Kiyosaki, author of Rich Dad Poor Dad. In this episode, Jack Bosch discusses his views on house flipping and – more importantly – how you should change your relationship with money in order to gain long term financial freedom. There is a very simple strategy to growing your passive income, and it all comes down to how you spend your money. Jack: Jack Bosch here, and welcome to the Forever Cash live real estate podcast. In this episode, I’m going to re-explain a concept that the famous author, Robert Kiyosaki, explained in his book, “Rich Dad Poor Dad.” There’s a lot of questions that people have, or people, I think, have misunderstood some of his message, and I’m going to explain it in a slightly different way. See you in a moment. Narrator: Welcome to the Forever Cash live real estate investing podcast with your hosts Jack and Michelle Bosch. Together, let’s uncover the secrets to building true wealth through real estate and living a purpose-driven life. Jack: All right, so here we go. What Robert Kiyosaki talks about with his cash flow, quiet rent, and all these kind of things is basically a whole bunch of different things. One of the things he talks about is… And, by the way, I love his books. I read almost all of them. They’re great books, and he does a great job educating the public about that a job is not a path to financial independence. So, what he talks about is the four quadrants, which is, like one of them is employee, one of them is self-employed, one of them is investor, and one of them is a business owner. And I’m not even going to jump into that too much because that concept, I think, can sometimes be confusing to several people, because they’re like, “Well, is the only way to financial independence being a business owner?” No, you can get there as an investor. As a matter of fact, I actually think that, ultimately. Or, “Is the only way to get there as an investor?” Well, no, you can get there as a business owner. No, you can get there as a W-2 person too. The key is, though, is that your activities and your outlook on what money is and how to use money needs to change, and that is going to be the critical distinguishing factor on whether or not you make it to financial independence. So, here’s one of my statements that Michelle and I have created. That is, basically, the money you make is not there to be spent on stuff. The money you make, you should be using to actually invest. So, from that point of view is, no matter which way you make the money, whether it’s W-2, whether it’s a self-employed person, like a doctor, dentist, or mowing the neighbors’ lawns, right, or as a business owner, is that money should be used, as much of it as possible, should be used to invest in two things only, in yourself for more knowledge, for more capability, for more, yeah, for more capability, and/or into assets that ultimately spit out cash flow. So, what Kiyosaki talks about in “Rich Dad Poor Dad,” how the first few properties he went and flipped, this is not a license for everyone to just go flip for the rest of your life. What Michelle and I learned from that was, yes, that you need, in order to make money, you’ve got to flip, right, I mean, if you pick real estate. Flipping is a great method to make money, but it’s not the end of it all, and that’s where a lot of people go wrong. A lot of people, they just, flip, flip, flip, flip, flip, flip, flip, and they flip for the rest of their life, and then they use all the money. They start getting used to it, and they start realizing, “Oh, man, I’m making good money with those flips. Let me upgrade my lifestyle. Let me buy the big car. Let me go on the big vacation. Let me do all this stuff.” And then, they actually just burn through more money because they figured out a way to make more money, and flipping is that way to make more money. So, Michelle even, and I even fell into that trap at the beginning because we started flipping, flipping, flipping, flipping, and after a while, keeping our expenses really low, we realized, “Oh, man, this is not stopping. This is actually scalable. Let’s keep going.” And then, we started upscaling our lifestyle, but soon enough, we realized, at some point of time, we realized that, “Well, you can’t retire from flipping.” So, what you’ve got to do is, at some point of time, you’ve got to take the money that you make flipping, keep your expenses low, and roll that money over into passive cash flow. And Kiyosaki talks about that in his book. When he, basically, after flipping the first properties, he made enough money to actually buy a few of these same condos. He like flipped a bunch, a bunch of condos, distressed condos. He made enough money to actually buy a few of them and then have them, hold on to them, and have the appreciation and the cash flow work in your favor. Because, if you buy and hold, especially when you bought low, in a way that you get cash flow, then you actually have appreciation and cash flow work in your favor. You get cash flow every month, but the asset, also, is going up in value every month and every year, and then at some point of time, when you go sell them or roll it over into something else, you now have enjoyed the cash flow for 5, 7, 10 years, and you turn around, and you sell the asset for 2, 3, 4 times what you bought it for, and you really doubled the benefits of that, all the while while getting tax benefits all along. So, you really have a triple whammy in that case, and that’s how real wealth is being generated. So, when we realized that, we started… We continued flipping, because there’s nothing wrong with flipping as long as you’re using it. As a matter of fact, our land flipping method, where you buy properties for 5 to 25 cents on the dollar is a perfect way to flip. Well, like if you can buy something for $2,000, everyone can afford it, nobody needs a loan for that. You take it in for 20, you sell it for… You take it in for $2,000, you sell it for $20,000, make an $18,000 profit. You do that 10, 20, 30 times a year, you’re making a load of money. And then what you do is, you take that money and you roll that over into two things. In your own education, because in order to then know about how to buy and hold houses, you’ve got to know about houses, so you’ve got to educate yourself, right. And then, you can even roll it in multi-family, which is the explanation of why we do those great things right now. We flip, actively, land, but we buy houses to hold, and we buy apartment complexes to hold for long-term, right, mid-term and long-term. Because, when you do that, you have now, you’re going from an active income strategy to a long-term wealth strategy, right. Hope that makes sense, a long-term wealth strategy. And that’s what Kiyosaki mentions when he talks about Monopoly, take four little houses into a big hotel. Well, but he’s not exactly clear about it. He just, he talks about all these different ways. He talks about building passive cash flow, but really what he’s talking about is: Step one, learn how to flip. Step two, learn how to take the money that you invest in yourself, of course, then learn how to take the money that you make and roll that money over into long-term passive cash flow. And when you do that, of course, you also want to invest it, not in treasuries for 2% or in bonds for whatever they give these days, but instead, into assets that give you a 10, 15, 20% return, after-tax return, on your money, because when you do that, you’re actually playing in Warren Buffett territory. You know that? Everyone is like, all the stock market is talking about how nobody can beat Warren Buffett. You know what? You can beat Warren Buffett. In real estate, by using modest leverage, by getting the deals after that you get below market, by getting deals for cash flow, the appreciation, tax benefits, when you take this all together, a very, very, on a consistent basis, every year pretty much, our returns rival those of Warren Buffett. Now, go figure. Are we geniuses? No. We’re following Robert Kiyosaki’s model, just that we tweaked it into land. We’re flipping land, and then we’re going and, actually, instead of financing land, we’re selling land with installment payments. Therefore, we’re creating cash flow from land, but even that cash flow is only temporary, right, and then we roll all that over and buy free and clear rental houses and buy apartment complexes with it. That’s the true meaning of Robert Kiyosaki’s getting out of the rat race. When your passive income is above your active income, then you are financially free. And, by the way, when you play at Robert Kiyosaki’s game, cash flow, you often don’t have to be the highest earner to get out of the rat race. You don’t have to be the highest earner to get out of the rat race. You can literally get out of the rat race by keeping your expenses also low and just building that passive income. And you build that by creating cash, rolling cash into passive income, keeping your expenses low, and then keep running it. And the most thing that we spend on is our personal education, as well as our investments. That’s what we put our money into. So, I hope that was useful as a clarification, as a guideline also, of what Kiyosaki really meant when he talked about that. And looking forward to your feedback, right. When you see that, we would love to get your five-star review off this podcast. The five-star reviews really, really help us, so make sure you go to iTunes, give us a five-star review. And then, other than that, we’ll see you in the next episode. Thank you. Bye-bye. Narrator: Enjoyed this episode? Then make sure you like, subscribe, and post your comments and questions below the video. We’re looking forward to hearing from you.